Through information kiosks in City parks, residents are able to learn more about the rich and diverse history of our community. These kiosks tell the stories of the families, businesses and cultures that were established in the area around each park; long before many newer neighborhoods were created. It's a great way to see how Chandler has changed over many decades. The program received a 2009 Award of Merit from the American Association for State and Local History (AASLH) through its 2009 Leadership in History awards program. In 2006, the history kiosk program won the Arizona Parks and Recreation Association's Outstanding Education Program Award. This kiosk recounts the history of Japanese American internment during World War II with a special focus on the Gila River internment camp, located just a few miles south of the park. It the result of work that began in 2012, originating from a Parks Board member with a passion for researching the baseball leagues that emerged at the Japanese internment camps of World War II. The project was funded, in part, by a grant from the U.S. Department of the Interior, National Park Service, Japanese American Confinement Sites Grant Program that supports exhibits and projects that preserve and bring awareness to this important part of our country’s history. The word, ‘Nozomi,’ means hope in Japanese. Hope is precisely what baseball gave many of the individuals held at the camps. It is for this reason that the kiosk is placed at a park where the baseball fields have prominence. This new kiosk highlights the story of the Honor Roll billboard that was erected in the park in May 1943, at the height of World War II. This sign listed the names of men and women serving in the military who came from Chandler and small neighboring communities like Higley, Queen Creek, Chandler Heights and Goodyear. By April of 1945, the Honor Roll featured over 700 names. The City replaced the billboard with a permanent veterans memorial in 1949. The kiosk also tells the story of Dr. A.J. Chandler Park, the City’s oldest park. Park Manors Park (formerly West Mini Park) at 395 W. Erie St. The kiosk features the area around Chandler High School, and members of several long-time Chandler families and their memories of the Park Manors area. Through photos and stories, the Arbuckle Park kiosk shares the history of the area bordered by Chandler Blvd. to the north, Germann Rd. to the south, Gilbert Rd. to the east, and Cooper Rd. to the west. The park is named for Emma Jean Arbuckle, a longtime Chandler resident who became a leader, a midwife and mother-figure in the local African American community. The history of racial segregation and eventual integration is also featured on the kiosk. Other panels highlight several pioneering families in Chandler’s history, including the Hamstra, Ray and Willis families. The founding of the nearby Chandler-Gilbert Community College in 1987 and its importance to the people of Chandler is also noted. Through photos and stories, the new signage shares the history of Chandler’s early schools, early streets, and the neighborhood that was home to some of Chandler's most prominent families from the 1920s through the 1950s. Many of the homes were built more than 85 years ago. The Chandler Arizonan newspaper gave the neighborhood its name in 1919 because residents could afford luxuries such as pricey silk stockings. Through photos and stories, the Tibshraeny Family Park kiosk shares the history of the area bordered by Ray Rd. to the north, Chandler Blvd. to the south, Gilbert Rd. to the east, and Cooper to the west. It highlights several pioneering families in Chandler’s history, including the Tibshraeny family, which has influenced the economic and political development of the community for many decades. Through photos and stories, the Ryan Park kiosk shares the history of the area bordered by the 202 Freeway to the north, Queen Creek Rd. to the south, Arizona Ave. to the east, and Alma School Rd. to the west. It highlights Chandler’s first airport, life on the farm for women, and the impact of the Ryan, Dobson, Whitten, Ortiz, Eckholm and other pioneering families. The name Espee Park comes from phonetic spelling of the initials "S" and "P," which stand for Southern Pacific, the railroad that used a nearby rail line for many decades. Through photos and stories, the Espee Park kiosk shares the history of the area bordered by Ray, Warner, McQueen roads and Arizona Ave. It highlights the impact of the Southern Pacific Railroad on Chandler, the popular Mustang Drive-In Theatre, longtime farmers such as the Knox and Shumway families, and former State Senator Marshall Humphrey. The kiosk tells the story of N.J. Harris, one of the first African American residents and businessmen in Chandler. It also highlights the history of South Chandler, and other families who came from the area. Thude Park is named for the Thude family, immigrants from Denmark in the early 1900s. The park itself was once part of the dairy owned by Frands and Bodil Thude. Gunnar Thude, who arrived first, began farming near Ray and Price Roads, and eventually went into the sheep ranching business. He ran a large operation from the 1940s until the 1970s. The Thude family sold the land around the basin to homebuilders, who began construction of their subdivisions in 1997 and 2001. Thude Park was developed in 2001. 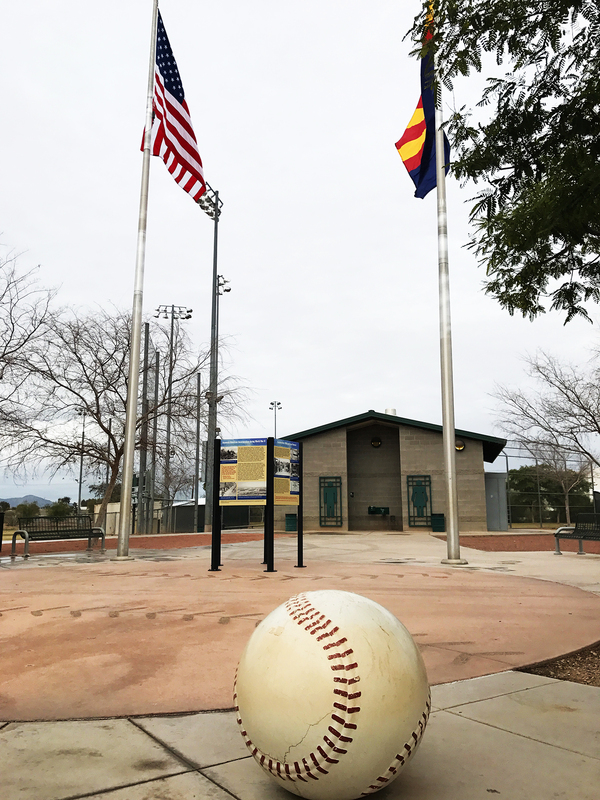 Currently, several parks have other interpretive signage related to people and events in Chandler, including Price Park, Navarette Park, Folley Park and the Snedigar Sportsplex.